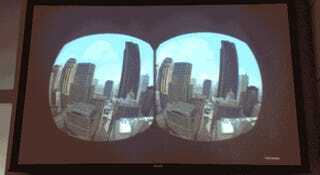 It should be a truth universally acknowledged that any man or woman using Oculus Rift will look like a dumbass. As awesome as it is to experience Oculus Rift, to everyone else, you are a crazy person with a black box strapped onto your face groping at thin air. And then I, of course, had to strap myself to some wings, stick my feet in the air, and flap my arms to Birdly—an ambitious virtual reality flying simulation. Birdly is more than just sticking a VR box onto your face though. Your "controller" is a human-sized machine whose only buttons are at the wing tips, forcing you to navigate as a real bird would. When you dive, the machine pivots you forward face first, imparting a very real sense of vertigo. When you flap your wings, you rise. A fan even blows "wind" into your face, along with smells of the cityscape below. When we first wrote about Birdly back in May, my colleague Mario observed it looked "creepy as hell" but "still, we'd try it if we had a chance." So when Birdly came to San Francisco, I reported for duty. At Swissnex, the project's head, Max Rheiner of the Zurich University of the Arts, told me they were amused but a bit peeved with Gizmodo's fixation on how crazy the contraption looked. As I climbed into Birdly, he told me to not flap my wings like a chicken but to soar gracefully like the red kite that Birdly meant to simulate. I'm not exactly sure it's ever possible to look graceful strapped to mechanical wings with a box on your face, but flying through San Francisco inside Birdly did simulate a certain type of grace. Weirdly enough, defying physics starts to feel intuitive. Rheiner's answer for the inspiration behind Birdly is simple: "human dreams of flying." Human experiences of flying have always been mediated by machines—whether it's a plane or a flight simulator—and Birdly, perhaps the ultimate, bizarre-looking flight machine, is meant to make you forget it's a machine at all. It was my first time using Oculus Rift so I didn't know quite what to expect, and like a dummy I wore thick-framed glasses that didn't fit in the headset. But the virtual San Francisco, constructed from satellite images by PLW Modelworks specifically for Birdly's Bay Area tour (the original Birdly flew through Zurich), was more video game-like than video-like, so I don't think it made a huge difference visually. The view of San Francisco from inside the headset, except it's a lot closer to your eyeballs, so you perceive it as one 3D image. Far more interesting to me, actually, was the physical sensations of "flying" through San Francisco. Years ago as a nerdy preteen, I remember being captivated by passages in a great work of literature called Animorphs that described what it's like to ride thermals as a red-tailed hawk. (In case you're not familiar, Animorphs is a 1990s-era sci-fi series where kids morph into animals to battle mind-controlling aliens. I loved it.) It was thrilling to realize that subtly manipulating the tip of a wing could spin me around or set me into a dive down the side of a skyscraper. Birdly allowed me to have a completely different relationship with physical space. This is, I think, part of the thrill of rollercoasters or sky diving or bungee jumping—experiences that briefly collapse time and space. For a few minutes inside a bird simulation, I escaped the physics that governed my land-based body. All of this is still made possible, of course, by the seamless images Oculus Rift beamed into my eyeballs as I manipulated my "wings." But the idea for Birdly actually predates Oculus. Rheiner and his students tried other virtual reality systems, but when they got their hands on a dev version of Oculus, it was a real revelation. "The wide field of vision, this really changes the feel," said Rheiner. It helps to understand Birdly is not someone's crazy idea of something to do with Oculus; it's someone's crazy idea that Oculus helped make a reality or, erm, virtual reality. When I went back to look at photos taken of me while using Birdly, I had to admit I looked pretty silly. My boyfriend said the photo of me above looked like something people of the future would use to laugh at 2014's technological ambitions—like our very own Matt Novak making fun of these perfectly nice people from the 90s. But the beauty of Oculus—and by extension, Birdly—is that as silly as it looks from the outside, it actually is astonishing from the inside. Any of us who have been into something considered uncool (read: nerds) have secretly or not so secretly believed that it gave it us access to some profound experience inaccessible to everyone else. In virtual reality, this is exquisitely true. If you ever have a chance to try Birdly, do. The rest of you can laugh for now.